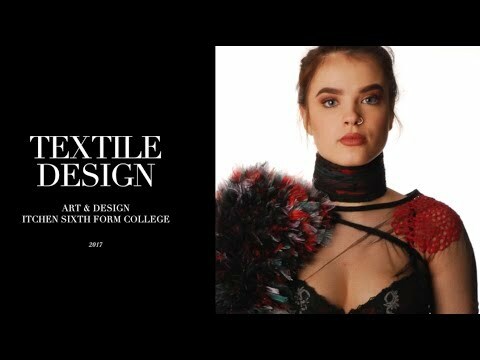 Textiles (Costume and Interior Design) is a course for those who are interested in fashion, costume design or interior design and those wishing to enter these industries. you have a passion for creative fashion/costume and interior design with a willingness to explore a range of stimulus from history and your immediate environment. you have energy, an enquiring and creative mind with the motivation to work inspired by other designers and craftspeople, with the aptitude for developing independent ‘alternative styles’ particularly in the second year. This exciting and stimulating creative textiles course covers a range of interactive approaches towards creative design making and textile appreciation. Research projects focus on a range of complimentary arts, inspiring costume and stage-set design briefs. You will learn to use a diverse range of materials and techniques, which will result in outcomes that personally reflect the expressive qualities of surface texture. Presentation of design processes will take the form of detailed illustrations, wall elevations and floor plans, preparing students to work in industry. This two year course will allow you to further develop your skills with the opportunity to specialise in either interior design or creative fashion and costume design. You will put together an exciting and dynamic portfolio of work revolving around independent interests and the development of design concepts. Constructed work will form the basis of this qualification and show a high level of expressive and personal outcomes. Students will have the opportunity to use our excellent facilities, including a purpose built, newly refurbished Textiles studio. Furthermore, students will be a part of our exclusive Creative Arts Academy and be able to go on several national and international trips. This course is recognised by UCAS and will aid progression to university where you may study, Fashion, Fashion Illustration, Interior Design and Fashion/Interiors, Business Studies and Costume Illustration. There are also many career options, including Fashion Designer, Interior Designer, Fashion Marketing, Window Dressing and Retail Management. Grade 9-4 in English and Maths and three or more GCSEs at grades 9-4 and A*-C, preferably including Art at grade 4 (or a portfolio of creative work). In 2017 Textiles A Level achieved 100% pass rate.